Since its founding in 1996, the ACDA has received many questions from parents who have lost a baby to ACDMPV. Since 2016, the ACDA has also provided information to families in receipt of a presumptive prenatal diagnosis of ACDMPV based on prenatal genetic testing without a familial history of ACDMPV. The ACDA is also regularly contacted by families for guidance with respect to the availability and complexity of the lung transplantation process. Below are answers to some of the most commonly asked questions. Please note it is impossible for the ACDA to know about all cases of ACDMPV worldwide and we are not medical professionals. Therefore, the following answers are based on the ACDA’s knowledge of ACDMPV. Please always consult with your qualified medical professionals. For a look at statistical information compiled by the ACDA based on families that have registered with the ACDA, please see the summary below (as of January 2019). What are the chances of me having another baby with ACDMPV? Do you know anyone who has gone on to have a healthy child? Is there anything that can be done during a pregnancy to detect ACDMPV? What measures should be taken upon birth of a subsequent baby? What is the longest a baby has survived with ACDMPV and is lung transplantation an option? Is there research being done on ACDMPV? How can I participate in the ACDMPV study at Baylor? Do you know if they are close to finding the gene that causes ACDMPV? How can I get a copy of the articles listed in this website? Are there any statistics, graphs, charts or other data available that summarizes the ACDA community of registered families? Worldwide, there are only a few hundred cases of ACDMPV reported formally in the medical literature since first identified in 1948. The incidence or prevalence of ACDMPV is not yet known but there are almost certainly more cases than those officially reported. The ACDA has grown to over 200 families from around the world. For most cases, the cause of ACDMPV is unknown. For additional information, please refer to the information on ACDMPV genetics HERE. Unfortunately, there is not a definitive answer to that question yet. For additional information, please refer to the information on ACDMPV genetics HERE. Yes, many ACDA registered families have had subsequent pregnancies resulting in a healthy baby. For a look at statistical information compiled by the ACDA based on families that have registered with the ACDA, please see the summary below (as of January 2019). Is there anything that can be done during pregnancy to detect ACDMPV? Unfortunately, ACDMPV cannot be definitively detected in utero at this time as a definitive determination requires the review of lung tissue via biopsy or autopsy. However, there is a prenatal test now available at Baylor Genetics that will detect a mutation in FOXF1 or deletions in chromosome 16 close to FOXF1 (contact Baylor at 1-800-411-4363), which may give a presumptive prenatal diagnosis of ACDMPV if such mutation or deletion is found to be present. Even in cases without a prior family history of ACDMPV, ultrasounds can sometimes detect anomalies associated with ACDMPV (commonly cardiovascular, gastrointestinal or renal anomalies) but evidence of an associated malformation does not confirm the existence of ACDMPV. If an ultrasound detects an extra-pulmonary anomaly associated with ACDMPV, a Chorionic Villus Sampling (CVS) or Amniocentesis can be requested and sent to Baylor Genetics to check for a mutation in FOXF1 or deletions in chromosome 16 close to FOXF1, which may give a presumptive prenatal diagnosis of ACDMPV if such mutation or deletion is found to be present. Many families notify the doctors and nurses at the hospital about their previous loss and the potential for problems. Several families have had their baby placed in a Neonatal Intensive Care Unit to be monitored and some have an oxygen saturation monitor placed on the baby for regular monitoring while at the hospital. There are a handful of cases where the child has lived beyond the time period where symptoms of ACDMPV typically present. ACDMPV classically presents in the neonatal period with irreversible respiratory failure. A small number of ACDMPV patients with atypical or late presenting cases have undergone successful bilateral lung transplantation. As of January 2019, the ACDA includes registered families of five ACDMPV affected children in receipt of a bilateral lung transplant with four survivors (currently 7 years old, 3 years old, 2 years old and 2 years old, after receiving their transplants at 9 months old, 5 months old, 4.5 months old and 2 years old, respectively). These transplants were conducted at St. Louis Children’s Hospital in Missouri, USA, Children’s Hospital of Philadelphia (CHOP) in Pennsylvania, USA, Great Ormond Street Hospital (GOSH) in the UK and a facility in Germany. For additional information about lung transplants, please click here. There are several other successful lung transplants for ACDMPV patients discussed in medical research journal articles but not all recipient families have contacted the ACDA, including transplants at Cincinnati Children’s Hospital Medical Center in Cincinnati, Ohio, USA. In 2017/2018, the ACDA also registered three families with children living with a presumptive or confirmed ACDMPV diagnosis without a bilateral lung transplant. Genetic testing identified abnormalities affecting FOXF1 in all three cases. Yes. A dedicated team of doctors and scientists at Baylor College of Medicine in Houston, Texas, USA are in a multi-year study to determine the genetic causes of ACDMPV. Since 2001, the ACDA has supported ACDMPV research at Baylor and encourages all newly registered members to donate DNA and tissue samples to the ACDMPV research team at Baylor in order to keep all known samples in one central location and database. As such, Baylor has accumulated the largest collection of DNA and tissue samples related to ACDMPV in the world. In 2017, Baylor was awarded a $1.9M grant from the NIH in the USA for a four-year study. In addition to Baylor, the ACDA has a close relationship with multiple other key ACDMPV research institutions, including Cincinnati Children’s Hospital Medical Center, St. Louis Children’s Hospital, Children’s Hospital Colorado and University of Colorado Denver, Northwestern University Feinberg School of Medicine, Children’s Hospital of Philadelphia and Sophia Children’s Hospital and Erasmus University Medical Center in Rotterdam. These facilities have a wonderful working relationship and frequently publish papers together while maintaining their different focus and expertise (i.e. Baylor is the lead genetic center, Cincinnati is the lead biological center, etc.). Several of these institutions are recent recipients of NORD research grants for ACDMPV research. Funds raised by the ACDA and The David Ashwell Foundation (our sister organization in the UK) are contributed annually to NORD for distribution through their research grant process. Please see our grant summary page for additional information on research grants: https://acdassociation.org/research-grants/. For further details on how to participate in the research, please click HERE. Contact: Pawel Stankiewicz, M.D., Ph.D.
All that is usually required is some information about your family and a blood sample from each family member. Dr. Stankiewicz is the lead researcher for the study and can explain in more detail what is required. The more families that participate the better the chances are of finding a cause and cure for ACDMPV. For the most recent information, please refer to the information on ACDMPV genetics HERE and the latest research update HERE. Several full articles are available for free, please click HERE to review. For articles requiring purchase, the fastest way to obtain a copy is to go to your local medical library and look up the articles in the medical journals. If you do not have access to a medical library, then you can request a copy from the ACDA – please send your request to the ACDA President at president@acdassociation.org. Update (January 2019): It has been about three years since we provided a statistical look at the ACDA community of registered families. 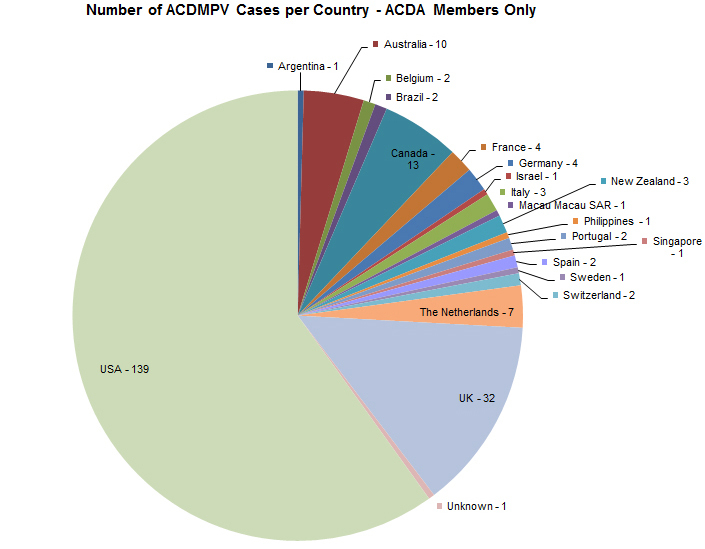 The following data is only with respect to families that have registered with the ACDA and DOES NOT include all reported or known cases of ACDMPV. In addition, the known case reports almost certainly underestimates the true prevalence of ACDMPV. We hope the charts and reports answer some of your questions and provide insight into ACDMPV. a. We are respectful of the privacy of families registered with the ACDA, and if you have requested that certain information not be shared, we suppress it in any data shared with other people (e.g. the ACDA Directory). However, all of the data is used to generate reports and charts because that information is not uniquely identifiable to a specific family. b. The data is intended to be accurate but please know some information may not be current or precise as the ACDA has lost contact with certain families over the years. Please always consult with your qualified medical professionals. 1. 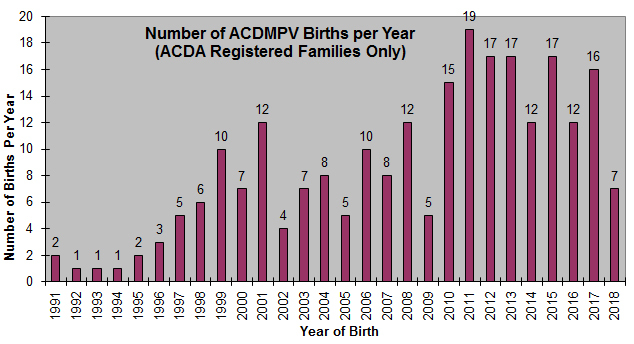 How many babies with ACDMPV have been reported to the ACDA? 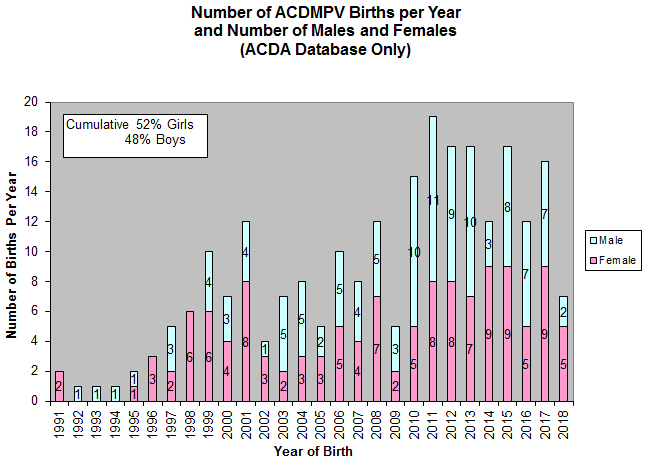 As of January 1, 2019, there are 244 confirmed or suspected ACDMPV cases in 233 families registered with the ACDA. Note there is sometimes a delay by families in their registration with the ACDA, which means births in the most recent year may not have registered with the ACDA as of this statistical update. * A Family is defined as children from the same parents (i.e. re-marrying would be another family). ** Note recurrence numbers do not contemplate a small number of families registered with the ACDA that did not pursue a subsequent pregnancy after genetic testing from the initial occurrence of ACDMPV revealed a familial connection. 3. Does ACDMPV affect males and females equally? The research papers we have seen indicate that ACDMPV affects males and females equally. As the sample size has grown over the years, the data is converging on the 50/50 ratio. The 2010 data was 57% female and 43% male, 2012 showed 52% female and 48% male and 2015 showed 51% female and 49% male. Current data in January 2019 shows 52% female and 48% male. 4. How long do babies with ACDMPV live? ACDMPV is considered a fatal diagnosis, however, some patients have survived with atypical or late presenting ACDMPV long enough to receive lung transplants. Lung transplantation is available in limited circumstances and there is otherwise no known cure, supportive therapy or treatment for ACDMPV. ACDMPV often presents itself within a few hours or days while the baby is still in the hospital, but in several cases it has not presented until weeks or months later. When the symptoms present and the level of care available to an ACDMPV baby affect how long the baby will live. 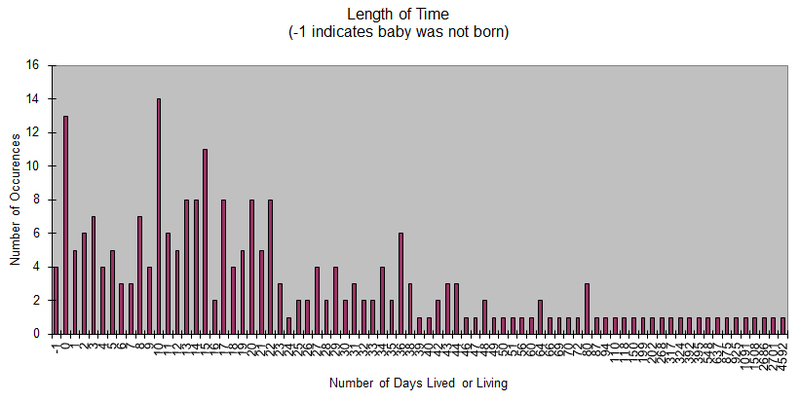 The ACDA does not have specific data on when babies presented with ACDMPV or what levels of care were provided, but the following chart shows that children live from less than a day to more than a year, in limited cases. *Note, the chart above includes seven children living with a presumptive or confirmed ACDMPV diagnosis who received a successful bilateral lung transplant (BLT) or living without a BLT (as of January 1, 2019). See question #5 below for further information about these specific cases. * Note there are several other successful lung transplants for ACDMPV patients discussed in medical research journal articles but not all recipient families have contacted the ACDA. 7. Where do ACDA families live? ACDA families are currently located in 21 countries throughout the world. The largest groups remain the same since the last chart with approximately 60% in the USA, 14% in the UK and 6% in Canada. 8. Are there any ACDMPV affected families that live near me? One of the benefits of registering with the ACDA is being able to connect with others that have also experienced the loss of a child to ACDMPV, the uncertainty of a prenatal diagnosis or the complexities of the lung transplantation process. When you feel all alone and like no one really knows what you’ve been through, communicating with other families can be very healing. The map below shows ACDMPV family locations around the world. The ACDA recommends reviewing to determine if anyone lives near you to allow more interaction for support or collaboration on a fundraiser. You can also consult the ACDA directory for more specific contact information (please contact the ACDA if you need an updated directory emailed to you). View Registered ACDA Family Locations in a full screen map. This map sets forth the location of a majority of ACDA registered families, as sorted in chronological order by birth date of their child(s) affected by ACDMPV. Markers show the approximate location via city and state without disclosing specific street addresses, names or any other personally identifiable information. *Note, this map will not exactly match other statistical information provided by the ACDA as not all members are represented on the map if privacy settings during initial registration restricted the sharing of their location. **In addition, there are a handful of families included on the map whose ACDMPV initial diagnosis was later retracted by their medical professionals. Note these families with a retracted diagnosis are *not* included in ACDMPV statistical information provided by the ACDA but their location is included on the map and in our membership directory as the loss of a child is a common bond and connections or outreach may be beneficial, regardless of the final diagnosis.